Welcome to my freshly painted door! Yes, the porch is back—well at least one of them is. The side porch has been restored, painted, stained and now the furniture has been moved back. It is the most wonderful feeling to have an area that is finished and back in order. The rest of the house, not so much. All of the old sliders have been replaced by French doors with side panels and they look fabulous! The electrical is functioning beautifully and the new counter tops look amazing! I love using these crazy patterns of marble and granite after having to use only ‘neutral‘ stone to help sell the houses we remodeled. We are waiting on one sink and one faucet—not kidding—to finish installing all of the faucets and finally have water. When the other sinks were installed last week the marble man broke his drill bit, so no faucets were installed. Note to marble man—bring extra drill bits. When the last sink and faucet are installed and the water turned on we can finally get the C.O.! I am sooo ready to get all of the packed boxes and furniture stacked up in the living room, dining room and basement moved to the new addition. I am a woman on a mission to get it finished ASAP! Apologies for all of the smokey, foggy photos—we have three large fires burning very close to Highlands and Cashiers. The laundry windows are spotless! 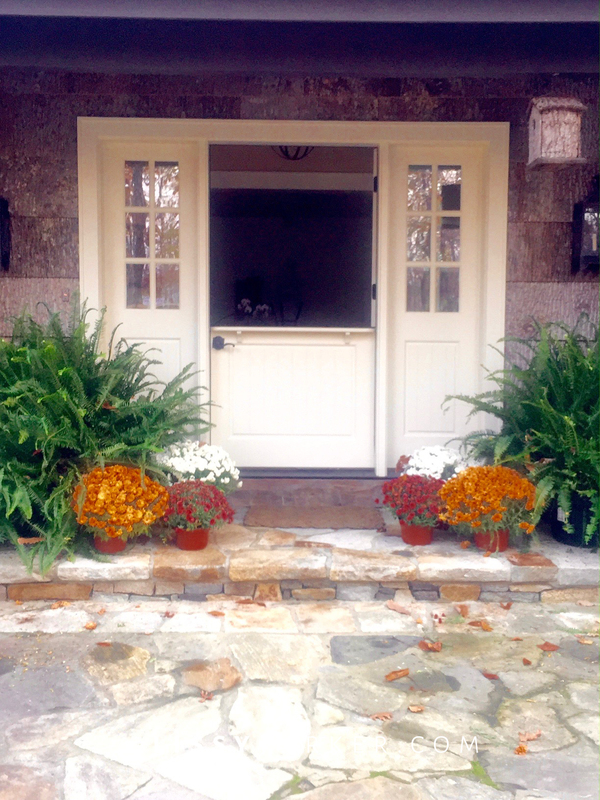 The new replacement doors look so nice—Janie and Gracie are loving the porch again. The leaves trying to shine through all of the smoke. The living room doors reflect the scene—need plants for the returning urns. The office roof is wearing a halo of leaves and smoke. The pantry is still a work in progress—but clean. Surprise from my Architect and Electrician—the pantry has lights! Mr. ‘P’s’ grill kitchen still needs a sink and faucet—but it is clean. The gas logs were installed in the fireplace—thank you Helen Ballard Weeks for the new lanterns. Janie loves the new porch/football area—and it is clean. Living room/staging area—not so clean! The other side of the living room/staging area—love my Swedish stove from Charles Faudree. Even the kitchen counters are full of things for the new pantry—HELP! Your house is absolutely perfect, no sinks and all. I want to sit on the porch with a cup of hot chocolate and watch the leaves rain down and then go to the football porch and make smores. Hope you are ready for a wonderful Thanksgiving. Sandra, thank you so very much! Still waiting on that one sink—lol.